Patented HFC12 Series couplings have flow comparable to many 1/2" flow couplings in a 3/8" body size. 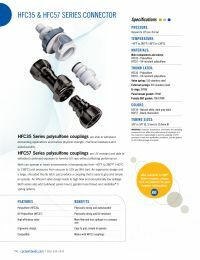 Compact and lightweight, HFC couplings replace bulky and heavy metal ball-and-sleeve couplings in a wide range of applications. An ergonomic design and a large, shrouded thumb latch pad produce a coupling that is easy to grip and simple to operate. An efficient valve design leads to high flow and low spillage. NSF-listed versions are suitable for use in water and beverage lines or food and condiment dispensing.